This morning City Council was voting on a motion to allow their bureaucrats to prepare a response to the Manitoba Ombudsman, after her investigation discovered that the city had not treated residents of Transcona fairly when Plessis Road was removed from the authorized Truck Routes list. On the city agenda, this was portrayed as revising a minor Bylaw issue. It is much more. Never mind that the city spent an extra $10 million to rebuild Plessis to meet standards, and then in effect wasted the money by removing trucks from that roadway. The Ombudsman, Irene Hamilton, not only rebuked the city for how the change was hidden from residents on the adjacent truck route which suffers now from the unexpected increased traffic, she found that citizens cannot be expected to navigate the vaunted city website to keep track of upcoming meetings, past and future agenda's, minutes of meetings, or participate in city processes. I'd guess that 99 % of the population, are not even noticing the importance of this matter on the agenda on TRUCKING ROUTES and how they are created and de-commissioned. Basically, in the big picture, it has no impact on their lives. They are not paying attention to this matter. Not the letter dated May 6th 2011, I mean the first one. Let me explain why her findings mean you are responsible for this truck route process but also for something much bigger that affects people city wide. reflected on the agenda at the initial stage of discussion (the East Kildonan-Transcona Community Committee), Day Street residents and other area residents potentially impacted by this decision may not have been aware of this situation." • The report added, "Most members of the general public would not know the process by which this type of issue would be elevated and be able to find the corresponding agenda and minute information." "as such, members of the public were not provided with advance notice that a decision that may affect them was being discussed. The information that had been considered in the decision making process was not clear. There appeared to be no opportunity for residents (other than those who signed the petition) to state or present their case(s). There appeared to be no opportunity for potentially impacted residents to challenge or dispute any information that was considered in the decision making process." "It would appear that given this situation, members of the public monitoring the city website information would not be able to interpret or be aware the issue being discussed, by which committee or office in the city, and when they would have the opportunity to make presentations. All of which seem to support (the resident's) concerns." "The report concluded, "it would appear that there are procedural fairness issues relating to truck route by-laws and deletions or alterations to these by-laws." This is all written in bureaucrat. I will translate to plain English. The people were left out of the truck route process, weren't given full information, were rooked out of protesting, and were told the city followed the rules. But the rules weren't fair and the website is in this case misleading and incomplete, and the residents of Day Street now have hundreds more trucks going down their street. How many of you came on The Great Canadian Talk Show on Kick-FM and told our listeners, call 311 - where do the 311 operators do? they look at the city website, and tell callers, go to the website, it's all there on the website, it's eeeeasy. But what did the Ombudsman discover? THE WEBSITE IS UNNAVIGABLE AND BROKEN. Why are you not bring told that in the report that is in front of you ? Who is going to be held responsible for this failure, this obstruction to the people's rights to fair treatment, misleading them when they complained, and refusing to make sure to protect their chance to have their say. The Ombudsman found that access to the decision making process IN ALL CASES is unnavigateable. IF the city website doesn't crash your Firefox, it takes 5 or 6 clicks to even get to the agenda listings -- Let alone figure out where to find things. And god forbid the information even be there- did you know the Ombudsman discovered that the original records of Plessis Road truck route discussions were missing from the website? So who knows what else is missing from the website on other public matters. I bet your department chiefs don't. And why should they, they know you don't care enough to pay attention. And you think, all you have to do here, is vote to tell someone else go fix this ?? That is YOUR job. Where is the direction? Where is the accountability? From bike paths on Assiniboine and Sherbrook and Berry, to the Parking Authority that has no complaint department and wants to hike rates, to a costly football stadium, to an expanding Convention Centre, to rapid bus rerouting through Parker Lands that even Councillor Orlikow complains he is kept in the dark about and might get the information with an hours notice -- so what chance do his constituents or anyone, the average person, have to fight city hall ? Heck, it's been established that one days notice in Fort Richmond to register to speak about stadium parking is acceptable. One day. And no one at City Hall answered the phone that Friday. THE PEOPLE KNOW YOUR BUREAUCRATS DON'T CARE. That's the dichotomy. The departments want thing streamlined and simple and with no deviations from their plans. It's like they are allergic to feedback. Yet you as politicians say, I believe in hearing from the people, we want your input. Well, that's what you say in October. Then when voters complain, you ask the bureaucrats, oh, is that how we do things? and they say, yaaaaaah. - It is not fair. - The average person cannot find things, interpret things, and find out when they could intervene. - The people on Day St were left out. - AND the Manitoba Trucking Assoc only found out after the fact. - And The Winnipeg Chamber of Commerce, their input sat on a shelf for 6 years. SIX YEARS. Yet your officials told the Ombudsman those groups had meaningful participation, so why are those homeowners on Day squawking, 'they just missed their chance that's all'. Who among you will move an amendment to immediately take steps to bring the website up to par using the Procedural Fairness guidelines provided on page 4 by the Ombudsman? Does that really have to wait 2 or 6 months while you go to barbeques or the lake or do whatever it is councilors do on summer break? People want to speak up NOW, about lots of issues and get involved, before you return in September. There has to be a specific direction to correct the way the city handles all public notices and consultations, a measuring of every aspect of that against this page of standards, and Council has to stop paying mere lip service to public consultation but do something. What is it called, a value audit? The Ombudsman just gave your website one. How do you solve disrepecting the public and discouraging them in any way from participating or worse yet, by trying to keep them in the dark that the city has failed ? You don't just farm the problem out to the administration. You take ownership. You tell the public, we goofed, help us make it better. Have average people involved as a test group as the website is revised. Tell - presumably Mr. Sheegl, what is expected and by when. And he has to be directed, via an amendment today, to provide more accessible and easy to navigate information and background on issues immediately. IN PLAIN ENGLISH and, I suppose, plain French. Approve it now. And another amendment, ask him to take this page of guidelines, and ask everyone in the communications office and every outside consultant and the head of public works, did we meet this standard, when did we not, and what are we doing to bring our transparency and public process up to this standard. I support the motion but as I said, these reports from the Ombudsman are a red flag. This is not only about truck routes delisting procedures, but about all any and all public consultation involving the city website. A number of you discussed the city website and public consultation on our radio show or in mainstream media and defended it. The Ombudsman says, you were wrong. You can revolutionize public consultation in this city and make it meaningful and make it work, or just limp along from vaguely worded notices nobody reads to vacant open houses to public outrage to lawsuits to letters from the Ombudsman on a case by case basis. Use this opportunity to fix public consultation now using these guidelines that require advance notice and being given information and a meaningful opportunity to state or present their case. And, by fixing the website. That is really the message the Ombudsman was sending, but she didn't write it in plain English. I hope you take the translation I have provided to heart. Coming soon: The City of Winnipeg has company in the Ombudsman's bad books. Exhibit 'B': Red River College. Does accepting 'Diversity and Inclusiveness' at Red River College depend on "the Quality of the People" in question ? Last week, instructors and employees of Red River College got a dose of advanced education, Stephanie Forsyth style. Having determined in her decade at BC's NorthWest Community College that "colonialism" had been "unknowingly perpetuated" on that campus, she ensured that RRC would get a head start at rooting out such snobbish attitudes. And so, a summer course to teach employees about being open to all cultures and tolerant of all opinions, was convened at the Notre Dame campus. Unfortunately, it was a little less impressive in practice than in theory, according to one insider. On day one, the instructor may have uttered less than flattering things about the City of Winnipeg from the get-go, surely an embarassment for Forsyth as she seeks to ingratiate herself among business and political leaders. No less embarassing was the revelation that said instructor apparently disregarded prohibitions against texting on the celphone while driving. An exercise in having participants define "My Multicultural Self" was followed by an overwrought PowerPoint presentation that lost their attention. On day two, the heavy anti-colonialist artillery was rolled out -- teaching the basic tenants of Aboriginal belief, if lining up guest speakers and having students present the textbook is considered teaching. Participants learned about the Aboriginal 4 Principles of "kindness, caring, sharing, truth"; of "life comes after water" such as thunderstorms, crying, and childbirth, and of "the Medicine Wheel"; were made to take part in a smudging ceremony; and watched the film "A Day Without a Mexican" before more lecturing from the instructor about tolerance. Alas, the teachings of that day came too late to impact Cathy Rushton. For Rushton, it appears, did not put acceptance of the principles of 'Diversity and Inclusiveness' at the forefront when it came to the radio station funded by the College, Kick-FM. Internal emails acquired under Freedom of Information laws reveal that Rushton, the campus Vice-President who was also treasurer of licensee Cre-Comm Radio, shared a very different attitude towards a broadcaster, who last November dared to challenge the cancelation of The Great Canadian Talk Show by Rushton's now-discredited "Executive Committee". Less than 12 hours after Kenny Atamanchuk blasted holes through the cover-up story designed to hide the involvement of Winnipeg Free Press editor Margo Goodhand and Forsyth in stifling the freedom of speech of the community via TGCTS, Rushton sent a link to an audio recording of The Kenny Show to another member of the Kick-FM Board involved in the cancelation, RRC Dean of Business Graham Thomson. She also included College lawyer Robert Buisson in the conversation. He has claimed to have had nothing to do with the radio station prior to succeeding Rushton as Forsyth's representative on the Board on December 14th. "This rant by Kenny certainly reinforce (sic) the decision to get Marty off the air before he could do his own rant" she huffed, forever obliterating any denial of the fact that Marty Gold was silenced in an abrupt and arbitrary manner without cause. Ken Atamanchuk is a Red River College graduate, who came into the Kick-FM fold 4 years ago as a listener wanting to volunteer with TGCTS. He contributed important stories about the floundering 511 emergency warning system and about which media moguls pocketed Spirited Energy campaign advertising dollars from the NDP, before starting his own eclectic Sunday afternoon broadcast. When he learned of the email to College officials attacking him, 'Spirited Kenny' went directly to Rushton about her actions and demanded accountability. Subject: Explanation of Comment From Nov 14th 2010 Required. Ms. Rushton: I have sent you a copy of an email you wrote on November 14. I am astonished that this is your attitude towards volunteers of Kick-FM. I will start by insisting you explain exactly what you meant by your comment about the "quality of person" I am, and telling me why the remark was included in the link to my podcast sent to Robert Buisson and Graham Thomson. I also demand an explanation why you would have sent this about me to Mr. Buisson at all, and to tell me what other conversations you had with him about me. According to his own emails, he had nothing to do with the station in November, and I certainly had nothing to do with him. As I have already officially complained about Buisson and Thomson to the Kick FM Board, do not even try to speak with them about my inquiry. In other words, keep it confidential. This is between you as a College official and me as a graduate and I expect you to respect my privacy and answer my questions as you alone are accountable for what you wrote about me. A week went by without a response, however local media reported that Cathy Rushton had been appointed to the Manitoba Immigration Council to advise the NDP government. Kenny well understood what was taught to RRC officials only last week, that there are no words in Cree for "coincidence". Surely by now you have refreshed your memory about what you said about me in that email on November 14th, what you meant by the remark about my role as a volunteer broadcaster on Kick-FM, why you sent the email to Mr. Thomson and especially Mr. Buisson, and what else you said to them about me. In light of your new appointment by the NDP government, my complaint regarding Mr. Buisson and Mr. Thomson's improper handling of an NDP "complaint" about my broadcast (sent to the College only one month after your email about me to those officials) takes on new importance. I would like to know exactly what you meant by "the quality of people" I am ? No reply was received from Rushton. Ever. So on May 11th, Kenny filed a formal Ethics Complaint with her boss, Stephanie Forsyth, about Rushton ignoring his emails and her use of a "prejudicial tone" in correspondence about him. "As a graduate of the College, I wish to file a complaint against Rushton for investigation under the College Ethics Policy... I have brought this Ethics Complaint to you, their superior. Accordingly, I will need to be advised of who this investigation will be assigned to, and to make arrangements to meet with them to review my documentary evidence. I request the courtesy of a response within 7 days as time is of the essence." Atamanchuk got no response from Forsyth within 7 days, or ever. And he could not have known, how true his remark about time being of the essence was. Exactly two weeks after his complaint to Forsyth, Rushton packed up her desk and left the Notre Dame campus - seemingly without any investigation into his complaint about her possible breaches of the College Ethics Code being commenced. Last week, instructors and employees of Red River College taking the course preaching 'Inclusiveness', learned of another word in the English language that does not have an equivalent in Cree. Certainly to those instructors and employees, and to graduates of Red River College and volunteers at the College-funded Kick-FM , the College Ethics Code was supposed to have been. Until it came to Cathy Rushton, and "the quality of the people" complaining about her, it seems. 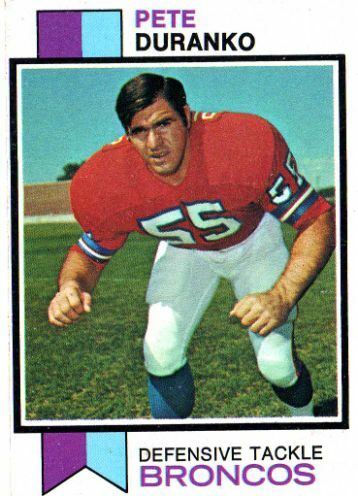 Last week, I commenced an interview for Slam!Sports with a former 1960's football lineman about his life and times, which included tours of North America as a hated heel wrestler, trained in the craft by Gene Kiniski. Given my penchant for remembering obscure players and rosters from my childhood, former CFL'er Mike Webster heard some names that brought a smile to his face. One of the former teammates I asked him about on Thursday, was the "Diesel", big Pete Duranko. Mike quietly mentioned, he's not going to be with us for much longer. And then I got an email forwarded to me about Pete passing away on Friday, after a courageous public battle with 'Lou Gehrig's Disease'. Coming out of Johnstown, Pennsylvania he headed to Notre Dame in 1963 as one of the most beloved high school footballers ever, athletically so gifted he was able to walk across the practice field on his hands. "Absolutely, Pete was the best," Penn State All-American Jack Ham, who became an NFL Hall of Fame linebacker with the Steelers, told the Pittsburgh Post-Gazette a few years ago. "He was my hero. He was a 220-pound fullback (in high school) and he just destroyed people. Guys would bounce off him. It was almost comical." Another Penn State All-American, Steve Smear, said " Absolutely, Pete was the best from our area." Just 7 days before his passing, Pete was able to attend his high school reunion. The email that was sent along to me, came from Notre Dame University's Cappy Gagnon, a student in the Sports Publicity Office back in the days (who proudly traces his roots to Rimouski, Quebec.) It is reprinted here with permission. matter), playing the spoons, and telling story after story! and later starred in the NFL, with the Denver Broncos. could fit a quarter through his ND class ring, his hands were that large. feat for a man of his size. I have known Pete Duranko since 1959 and he was still the same guy until the day he died. I had planned to visit him this week as I would be in town again...now my visits back home won't be the same without him...he was a very special human being. His exploits off the field exceeded his on field achievements! He was an ALL PRO in attitude, courage, fortitude and a genuine great guy! His head never got to big for his helmet and to me he exemplified a true BMHS J-Towner! Theresa Oswald asked: what's your plan to reduce Concordia ER wait time? On Monday I was stunned to read of the medical dilemma facing 87 year old Max Pressman, whom I am related to by marriage on my mother's side of the family. His son David and I were frequent teammates at the YMHA as teens. Max's daughter Selma was horrified that her elderly father was going to have to wait 9 months or more to find out if he needed a pacemaker. "Last week, Health Minister Theresa Oswald boasted of the "A" score the province had been given from a coalition of professional medical associations for the patient wait times associated with elective open-heart surgery. But the assessment by the Wait Time Alliance only measures the period of time a patient waits for a procedure -- after -- a medical specialist makes a decision on what procedure needs to be done until the procedure is completed. Based on that definition, the clock hasn't even begun ticking for Max Pressman..."
Selma threatened to fly him to Calgary for a simple 15 minute procedure. Lo and behold, an appointment for an echocardiogram suddenly became available the next day. Lucky it wasn't an emergency, I thought with great sarcasm. Well,now another person I know had dealings with our health care system this week- and it was an emergency, for his wife. Jeff Doyle has just sent an email to Theresa Oswald, Premier Greg Selinger, and Conservative health critic Myrna Driedger about it. A Red River College graduate and frequent guest on our radio show, he asked for this email to be published on our TGCTS blog to get their ordeal at the Concordia Hospital ER, and his challenge to the NDP government and PC opposition, out in the open.
" I am writing this in the hopes of receiving some measure of feedback from the parties responsible for causing delays of this magnitude to occur in today's Canadian Health Care system. In addition to forwarding this message to my contacts within the local media, the social media and - of course - to my Distinguished Members of Parliament, I am forwarding this more directly to my friends and family outside of Manitoba. It is my hope that information of this nature will - if nothing else - shame the people responsible for allowing situations like this to occur, and make them think twice before talking about how "well maintained and wonderful the Health Care System in Manitoba" is. However, if history continues to be a roadmap for the future - I am doubtful. On Monday morning, after a long night helping my wife deal with a chronic abdominal and digestive issue we decided to venture into the Concordia Hospital ER. Upon our arrival at 8 AM I was initially impressed with the new layout and set up in the admittance area. We were quickly signed in, spoken to the Admittance Nurse and then were asked to begin our wait. Given my wife's inability to sleep the night before, we took advantage of the "Quiet Family Room's" couches in order to let her attempt to rest while we waited. Waiting in an ER is nothing new of course. ER's across North America are often completely backed up given demand being greater than availability. This is all completely understandable. And before we go any further I want this made clear on the record that every medical staff member we dealt with at Concordia was efficient, professional and compassionate. When we arrived in the ER there were only 4 other people ahead of us. At no point in time while we waited did I notice any Ambulance Arrivals with life or death immediate attention required patients. This is not to diminish the needs of the other people waiting (or the ones already being attended to of course) however, it seemed we were all in the same boat. After 90 minutes (930AM) and 2 more dry heaving, uncontrollable vomiting incidents later a medical aide came to us and took a blood sample. 2 more patients arrived by this time. At 10 AM a sharply dressed lady entered the Quiet Room where my wife was resting and informed us "You'll have to move out of here, we do a daily briefing in this room." After my moment of shock passed, I questioned why they would hold a meeting in the ER Waiting Room when there must be somewhere else in the entire hospital better equipped for such a task, I received no answer other than "We need this room, please go." Swallowing my burgeoning rage, we complied. After moving my car 2 more times to avoid being ticketed while waiting, and several more convulsions from my wife we were finally Triaged by noon. Yes, halfway through a standard working day, my wife was Triaged. By 1245, a medical student came in and began an analysis. At this time I asked if this type of delay is normal, and was sadly informed that it was. Apparently, Concordia Hospital only has 1 Doctor working the entire ER. So, an excessive delay is status quo. Now eventually the doctor came by, diagnosed my wife and provided assistance. All of that is fine. She was released at 4PM (which given the time of treatment - 145pm) isn't unreasonable. Again, every medical staff member we dealt with was exceedingly professional and helpful. However, I find it completely unacceptable to have this kind of a delay for ANY patient. I know the excuses will always be the same - "We are understaffed, there was a high volume, it was a long weekend, etc etc etc". But frankly those excuses hold no water in today's society. In my wife's case, her situation is painful and very upsetting but thankfully it wasn't life threatening. But how would anyone know that, given the evidence in the waiting room? How could anyone know that her appendix wasn't on the verge of bursting, or something more significant along that line. In instances like those, a 4 hour wait is a matter of life or death. This is why people go to the ER, because they are dealing with an emergency! If it wasn't a big deal, people would book appointments with their Family MD's and be obliged to wait. This very reason alone to me suggests that there needs to be an even greater emphasis put on staffing for Emergency Rooms all across the Province. And yet we see where the Province places their Health Care priorities every day. The WRHA has the funding and staffing to build a massive new building downtown for their bureaucratic staff - who admittedly need a place to work - but can't make sure to have enough doctor's in all the ER's in the city to be able to handle more patients as they come in? Cancer Patients are driving down to the Mayo Clinic in the States, paying exorbitant fees in extra insurance in order to do so because they can't get access to proper treatment in their home country in a timely fashion? 11 month waits for surgeries are becoming commonplace despite what the PR Spinners would have you believe. Several years ago I defended the Health Care system publicly after the UFC Champion Brock Lesnar compared to the Brandon Regional Health Authority to a Third World Country. And while clearly, we aren't quite at that level the facts remain that everything isn't as streamlined in our Health Care system as it should be. So I ask this of you. Especially going into a pivotal Provincial Election this fall - What do YOU Propose to Do in order to make ER wait times more acceptable? And HOW do you plan to make this happen. Your constituents are sick of waiting. * Speaking about the new WRHA building, blogger Graham Hnatiuk explains how the geographically-challenged Winnipeg Free Press may have already "relocated" it to the North End, in a great piece about how downtown revitalization stories are reported, or "Someone needs to put a map up in that Winnipeg Free Press Cafe." "Could you imagine if we started calling the Police every time we heard fireworks go off? And what would the Police tell us? Do you think they would sent a cruiser car out to investigate? I don't. I think fireworks are allowed in the North End. I think they are the norm in the North End. Just like everything else that is illegal or unacceptable in other parts of town. How many issues are there in the North End that are now the norm, now acceptable, and now just part of our daily lives, that would be unacceptable in any other part of the City? How many neighbourhoods would put up with the fireworks, illegal dumping, unkempt yards, parties to all hours of the night, dogs barking endlessly in just about every yard, feral cats roaming the neighbourhood, open liquour walking down the street, blatant drug deals, people yelling at the top of their lungs in front of their friends house to "let them in" ...... The list goes on and on. And why are these things allowed to continue here?" Do the voters need to teach City Hall a lesson in civics again? Last year, everyone thought City Council was turning over a new leaf when it came to including everyone in our town in planning for our future. Active Transportation project organizers failed, in the development phases, to include many of the residents and businesses neighborhoods targeted for "improvements" in discussions. Rushing the projects because there was federal government infrastructure money to spend on the demands of the bike lobby was the priority. (Those pesky deadlines). Furor was heard from the north end to Berry Street to Grosvenor to Sherbrook and of course the gem of the mismanaged lot was Assiniboine Avenue. The stakeholder list there included bike lobbyists and groups from far and wide, but excluded business and property owners of South Broadway. They have taken their fight to court, where a judge refused a city ploy to toss the suit. Oh sure, the city claimed they did their best, and shifted the blame: People don't want to come to meetings. It was in winter. It was in summer. It's not a roundabout, it's a traffic circle. Pledges by council incumbents to reform and make sure the voters and taxpayers and business owners were sought out and heard in future were at the forefront of election platforms. Well, the new season of Open Houses kicked off with something called the Corydon-Osborne Neighborhood Plan at Gladstone School last Wednesday. And nothing changed. In fact, it got worse. Not a single flier was distributed to homes about the session. Less than 100 citizens showed up over the 4 hour exhibition. Oh, enthused Councillor Gerbasi, we ran an big ad in the Free Press and their area weeklies (that no one recalled seeing). Golly, we promoted it on a Facebook page (that had, as of the night before, only 33 followers plus 3 area politicians). Gee, Bike to the Future and local MLA Jennifer Howard sent out emails (which did nothing to inform those who are not from their camps). Then there was the emails to the 'stakeholder list'. A list made up only of the people who went to the preliminary Design Workshops last month. In other words, if someone had to watch the cash register on those 2 days in May and could not make it, they are not considered stakeholders by the city now. Although the city did a mail drop in Osborne Village for the May meetings, Councillor Gerbasi, city planners and communicators did NOTHING to make sure Osborne Village was made aware of the Open House that followed it. Major reforms were being discussed for Confusion Corner, the Corydon strip, and the new Rapid Transit station area which supporters pray will draw mixed use apartment towers. So who needed to hear from the neighbours ? Apparently not the City staff and consultants. Nothing was sent to residents of Gertrude, Wardlaw, Stradbrook, or any other street. Nothing was provided to any of the Osborne Street enterprises that maybe, just maybe, might maybe want to know if a traffic circle, curb extension, or street direction change near their premises is being contemplated. Once again, public consultation is being guaranteed the bike lobby and others already plugged into the system, but not for those directly affected in the neighborhoods that special interest lobbyists want to see engineered and re-jigged to their convenience. Wait a second. That wasn't supposed to happen again. Regardless of the excuses- the Village has its own Plan, there were posters inside the bus shelters, there's a postal strike - it wasn't supposed to happen. Urban planner phraseology like "transformative areas" and “collective design process” registers a big zero on the 'what does it matter to me’ list. And that's the key. Those responsible for this failed methodology KNOW plain English works. But they don't use it in the ads and posters and so, people tune out. Councillor Gerbasi said that when people see fliers from the City, they just chuck them in the garbage. The funny thing about fliers is, if it was headlined " Parking on your street may change ", " How about a parkade at the corner? ", " Is safety on your street a problem? ", the residents WOULD pay attention and get involved. The fewer voices speaking up, the easier it is for the social engineers and lifestyle lobbyists who know their way around city hall to change our streetscape and land use and business environment, to suit their agenda. A lot can change in a year. The way the city approaches development planning and Open Houses did not. It can, starting now, if you step up and say, not again, it’s your job to get the word to the neighborhood about this process in an effective way. The Free Press is not the only paper in town people read, especially around cafes and patios. How about radio ads. OR - How about fliers written in plain English and sent to the people affected ? You can call Councillor Jenny Gerbasi at 986-5636. It's worth a try, because claiming that the planning for Corydon-Osborne is adequate thus far, when maybe 200 people have had input and the folks from the Osborne Village were left out, is not Our Winnipeg, it’s someone else’s. PS- a reminder from last August, how the residents and businesses of Sherbrook were doublecrossed even with "public consultations", and how Coun. Harvey Smith called for the head of AT coordinator Kevin Nixon.